The concept of an empty inbox has become almost laughable these days. With smart phones and devices of every variety, we have access to our email everywhere, all the time. Social media provides a whole new set of inboxes, not to mention notifications that arrive via email. There’s also the fact that most of us these days have more than one email address which only multiples the inboxes we have to manage. With all these notifications and newsletters and free gifts for opting in to yet another email list, an empty inbox seems as likely as that mirage of water on the desert sand. But “Inbox Zero” is possible. And in fact, it’s the secret behind the productivity of many professionals–and the sanity of many individuals. The concept was developed by productivity expert Merlin Mann. And it’s not really about that actual number of emails in your inbox, but about the amount of time your brain spends on your inbox. Mann’s point is that too often, we confuse our inbox with the true workday priority: our to-do list. We spend so much time checking our email that we don’t get anything else done. 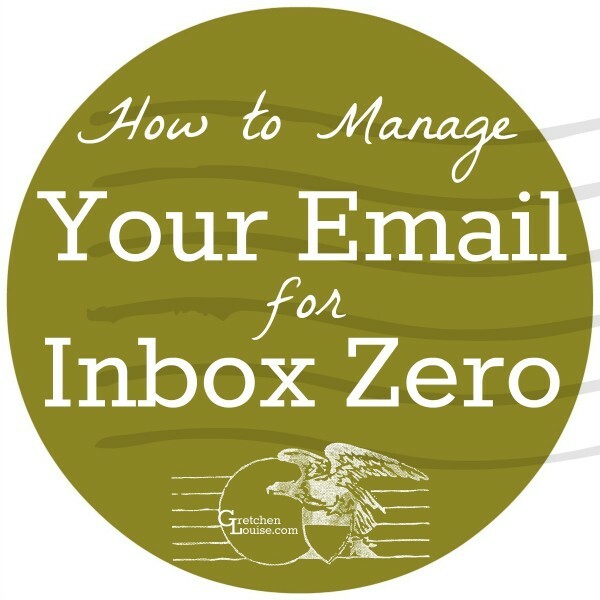 But once you’ve taken control of your inbox, it’s a whole lot easier to manage your email and keep that inbox close to zero. Here are 7 tips to help you spend less time on your inbox, more on your to-do list. Click to Tweet: Here are 7 tips to help you spend less time on your inbox, more on your to-do list. 1. Don’t check your email, process it. Do you scan your inbox on your smart phone 101 times a day without doing anything about it? Do you read each message every time you get a notification but never actually respond? Don’t let yourself check your email without processing it. With so many ways of checking our email, so many forms of notification, it’s easy to slip into the habit of reading our emails and letting that be the only action we take. Form the habit of not reading email unless you can respond and your inbox will be a lot more likely to stay at zero. Don’t open your inbox unless you have 10 minutes to dedicate to emptying it. You’ll save time if you schedule slots throughout the day to check your email and respond to it. 2. Discern between the Archives and Trash. Are you a hoarder of digital data? Do you need to know you can access any former email communication at any time? Or are you a neat freak who can’t stand clutter, digital or otherwise? The beauty of the Archive button is that you’ll never have to regret trashing that email. Archive what you’re done with. Delete what you don’t ever need to see again. It’s too easy to just keep hitting the trash can icon and then realize two months later that you accidentally deleted a very important message. (Most email programs or services empty trash on exit or within 30 days.) Archive your bills, archive conversations with clients, archive that brainstorming session with your best friend. Trash the blog posts that you can find again via Google, trash the comment replies from other blogs, trash the social media notifications you can find again there. There are some emails you’ll need to Archive and reference again–for everything else, there’s Trash. 3. Master the “5 sentence email”. Do you avoid those long emails in your inbox because you feel like they deserve a long, heartfelt reply? Let go of your guilt with “the 5 sentence email”. Most emails really can be answered in 5 sentences or less. There’s no need to write a book in response, even if their question was sincere and heartfelt. Be known for quick replies and you’ll be forgiven for your brief replies. Embracing the art of the 5 sentence email is the best way to keep your inbox empty. If you’re desperate to clear out your inbox but really need to respond further to something, send back a quick reply with a question. It will put the ball back in their court–and get the email out of your inbox. Set aside a specific time each day or week to answer the few emails that require action or really do need more than a 5 sentence reply. How often do you find yourself answering the same questions over and over again? Do you feel like you waste time every week typing out the same reply to similar queries? You need to craft a few concise, default responses. Create “canned responses” that you can quickly insert (with a Gmail Lab or client extension) or copy and paste (from a Word Document or an Evernote file). You can quickly tweak them to fit the subject of the email if necessary, but you’ll save yourself time in the long run by creating some canned replies. 5. Empty your Promotions and Social tabs/labels regularly. Do the promotional emails keep piling up no matter how many you unsubscribe from? Do you never even look at your social notifications because you’ve already seen them on Facebook? Make it a weekly habit to empty your extra tabs. 6. Stay on top of your Spam. Who loves checking their spam folder? Unsolicited messages. Notifications that you have inherited a million dollars if only you’ll send them your bank account number. Really inappropriate advertising. No one likes sorting through all that junk, but sometimes, real email slips through the cracks. That makes the spam folder another spot you want to keep at Inbox Zero. Check your spam folder once a day. Do a quick scan for anything important and mark each one “Not Spam”. Take a second glance to see if your spam folder contains a promotional email you signed up for: do the sender a favor and don’t empty your spam without marking it “Not Spam”. You are an important part of training every email program about what is spam and what is not spam. Once you’re sure the rest are truly unsolicited messages, empty your spam and enjoy the view of an empty inbox–even if it is a spam inbox. 7. Don’t let your inbox become your to-do list. How many times a day do you scan your inbox to see what you need to do or reply to next? How often does that distract you from what is really at the top of your priority list? Your inbox may contain items that belong on your to-do list, but don’t let your inbox become your to-do list. Using your inbox as your to-do list wastes time. Not only do you get distracted by new messages, but you spend time scanning old messages for your top priority items. Have an email that needs action? Add it to your to-do list and then archive it until you’re ready to act upon the task. If you use a to-do list app like Todoist, you might even have the option to add the email as a task. You can archive the email and the link in your task list will take you right back to the email when you’re ready to work. What methods have you found work best for managing your email? Inbox management is always a work in progress. I’d love to learn from your experience in the comments! I only recently became overwhelmed with email so I appreciate this post very much. Very helpful. On keeping on top of Spam. I use SpamSieve, which is fabulous but as you say, the odd message does get snatched. I found that sorting by sender or by subject makes it much easier to find that one message. I get hundreds from Dr Oz, Notice to Appear, Mighty Deals, eHarmony, Dr. Mercola, fake banks, etc. I do let them pile up for a week or so. This method actually makes it easier if there are more. If I’m expecting a message that doesn’t arrive I do check spam. I’m super guilty of using my email inbox as a to-do list! Thanks for this list….I have a lot to work on, but you had some great tips! I love Todoist and totally agree with that last point! It has helped so much but part of me still likes writing out a to-do list because I love the satisfaction of physically crossing things off of a list. Thank you for such a concise and useful set of instructions for getting/keeping my inbox at zero!